Have you ever been served ice in beer in Thailand? Well in Thailand it is a common occurrence. Especially in the northern parts or the less touristy areas. In less touristy areas it is popular to drink your drink out of a glass, so to keep it chilled they add some ice. If you order a bottle of beer, you are normally served the bottle with glasses and a little bucket of ice with tongs. What may seem strange in Western culture becomes apparent when you start to drink the beer. The ice obviously keeps your beer cool but it doesn’t really dilute the beer taste much, it just makes the beer cold. 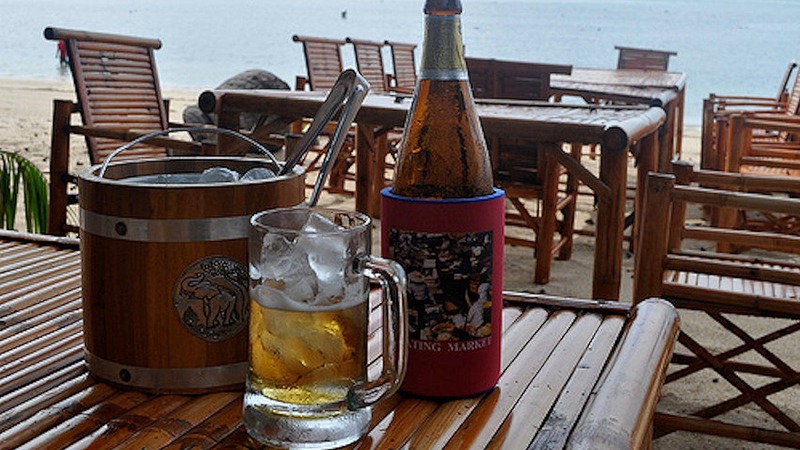 With an ice cold beer you appreciate it with the Thailand heat, as it keeps you beer cold all the way to the bottom. Thailand beers are high in alcohol so even if it does dilute it a bit, your beer will still be of high standards. If it is your first time in Thailand then it will feel weird or unmanly to drink it this way but after a few ice bevies you will appreciate it more. If you decide to take this custom home with you, you will get some strange looks and be told how men do not put ice in their beers. You will be the expert because you will know that it will not harm your beer but enhance the beer temperature ’til the last drop. Even if it does water the beer down a little, it does not change the strength because you are still drinking the same amount of beer. What is worse? Drinking a warm beer to the last drop or having a nice cold beer on a hot Thailand day? I would choose a cold beer on a hot Thailand beach or bar any day.